That’s what Paul McCartney reportedly told journalists aboard The Beatles’ first flight from London to New York, just hours before being greeted by thousands of screaming fans at John F. Kennedy airport and infecting America with Beatlemania. His anxiety was understandable. After all, what were the odds a few pasty British dudes could make it in America, the land that birthed rock ’n’ roll and the artists whose music made The Beatles what they are? Record executives seemed to echo the same doubts. Despite their success in the U.K. and Europe, Capitol turned down not one but two opportunities to introduce The Beatles to the U.S. in 1963. That honor fell instead to two smaller labels, and the band failed to crack the charts. Capitol didn’t give in and pick up “I Want To Hold Your Hand” until the band was booked for its fateful appearance on The Ed Sullivan Show and came equipped with its own free nationwide exposure. That’s not exactly a vote of confidence. It’s safe to say things worked out pretty well for Mr. McCartney and his buddies, though. 1964 will forever be remembered as the year the Fab Four dominated American airwaves and shook rock ’n’ roll from its slumber. Paul was seriously overselling the state of mainstream American rock. 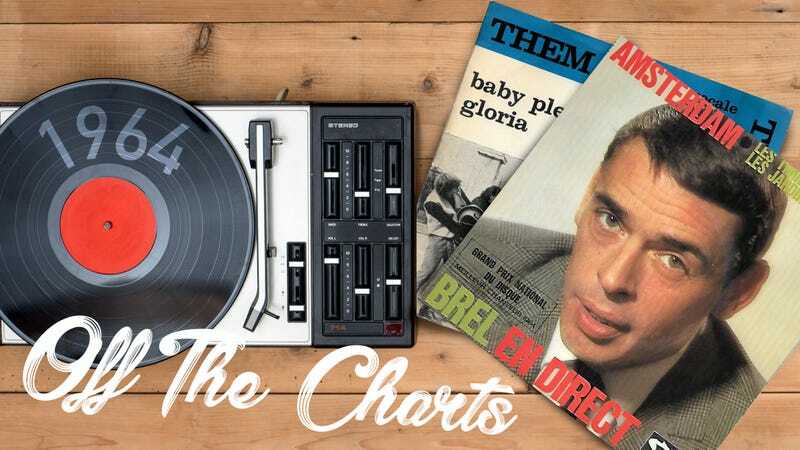 As far as the charts were concerned, it’s true the fledgling genre fell into a sort of dark ages for the five years—nearly to the day—between “The Day The Music Died” and The Beatles’ arrival. Surf rockers twanged out the occasional hit, Dion and Del Shannon scored with singles that somehow sounded like throwbacks to a heyday that had barely passed, and The Beach Boys worked their way up the charts, eventually landing the top single of 1963 with “Surfin’ USA.” But beyond that, it was slim pickings. Country, Motown, girl groups, and crooners named Bobby dominated the airwaves. The Beatles’ conquest of 1964 marked a turning point, a hard delineation after which rock bands stormed the charts once again. But the British Invasion is just one of the many important musical stories coming out of 1964. Rock may have lost its nationwide megastars during those five dark years, but it spent that time percolating in influential regional scenes. The prickly fruits of that gestation finally matured into garage rock and its gritty, blues-obsessed punk forerunners, like Tacoma’s The Sonics and Boston’s The Rockin’ Ramrods. In New York, Simon & Garfunkel stumbled their way toward stardom, and a satirical dance song brought Lou Reed and John Cale together, giving birth to a tandem and a style of guitar playing that would change rock history. In France, a teenage yé-yé icon came into her own and two of chanson’s greatest singers released masterworks. In England, two hard-edged bands missed the memo about that whole invasion thing but forged paths of their own. And that’s not even half of the important, impressive, and overlooked tracks we’ll be exploring in our alternate top 20 for 1964. Note: Not all of this edition’s songs are available on Spotify.